The fight video embedded in the POTD video below was brought to my attention by Chad R. over at the American Warrior Society (which, by the way, is a sponsor of Law of Self Defense, so if you’re interested in self-defense instruction I encourage you to take a look at lawofselfdefense.com/americanwarriorsociety). The video is provided courtesy of the LAPD and shows a man in a fistfight with two women. We don’t have time to cover every facet of this encounter in a brief Post of the Day. In particular, I’m not drawing any conclusions here about which party might have been in the right, as I lack the facts necessary for an informed discussion of those issues. There is, however, one particular issue I thought worth highlighting for those of you discussing this case. This is particularly so in those discussions centered on whether the women would have been entitled to escalate to deadly defensive force in defense against the man’s punches. I’ve seen several folks whose discussion of that particular issue begins with the premise that the women were automatically in a vulnerable disparity of force situation with respect to the man, and therefore potentially entitled to escalate to deadly force because they are women who are fighting a man. While this position is understandable, for reasons I’ll touch upon in a moment, it is a misunderstanding of the law, and can easily lead to an incorrect analysis of a use-of-force situation. What the law cares about is the actual force in play, meaning in use or imminently threatened: period. If one party is bringing to bear force reasonably capable of inflicting death or grave bodily injury—even if they are doing so with their bare hands, such as with a punch—that is the circumstance that could trigger a justification for a deadly defensive force response by the victim of that force, particularly if the victim has no reasonable means other than deadly defensive force to neutralize the threat. Now, it’s generally true that factors such as gender, age, and numbers often have such a disparity of force “baked into the cake.” Men tend to be substantially larger, stronger, and have a greater fighting ability, than women. Younger people (exclusive of children of course) tend to be fitter, faster, more resilient to injury, than older people. A single defender facing multiple attackers tends to be in a tactically inferior position. Note all those qualifiers, however: “it’s generally true,” and “tends to be.” In the actual analysis of an actual case what actually matters is: IS it true that such a disparity exists?. Just because there’s a disparity of gender, age, or numbers doesn’t mean it’s necessarily true that such a disparity exists. It’s not hard, for example, to imagine a strong woman in a fight with a weak man. The man’s gender doesn’t magically give him a tactical advantage in that confrontation. Similarly, one can imagine a fit and well-trained 60-year-old possessing a considerable advantage in a fight with a 20-year-old soy-boy, all other factors being equal. Similarly, multiple attackers are likely to possess a substantial tactical advantage over a single defender, but there could well be circumstances where that’s not the case—I doubt that I and any neighbor I might choose would do particularly well ganging up against a world-class fighter, for example. 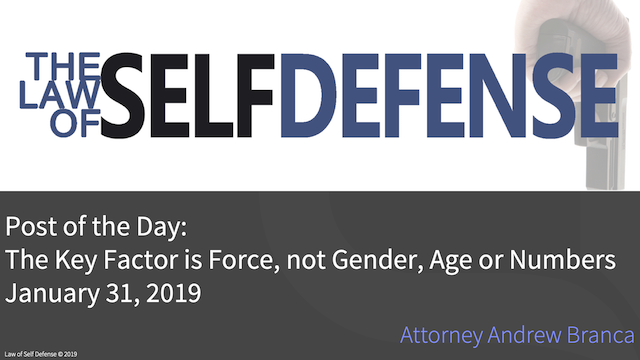 What such factors as gender, age, and disparity of numbers do is strongly suggest that the existence of a disparity of force that might justify an escalation of defensive force to an intensity that wouldn’t otherwise be lawful. What they don’t do is automatically justify such an escalation. At the end of the day, one must still demonstrate an actual existence of a disparity of force. Mere suggestions of its presence like gender, age, and numbers, will not by themselves be sufficient.